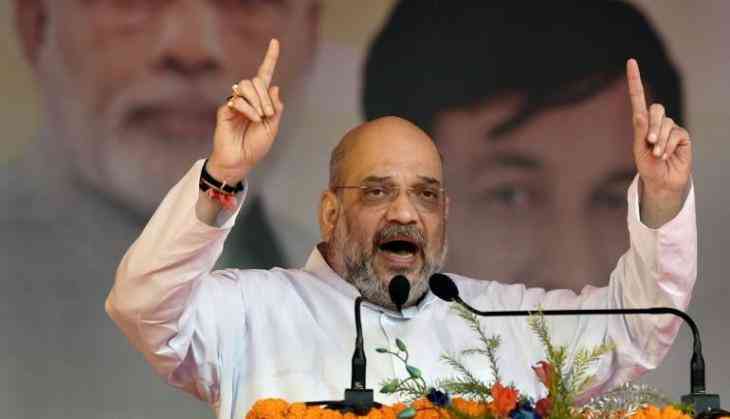 BJP president Amit Shah Saturday formally launched the party's mass contact campaign in the Malwa-Nimad region of poll-bound Madhya Pradesh. Shah launched the 'Maha Jansampark Abhiyan' from the Rajwada area and sought support from the people for his party in the upcoming polls. He garlanded a statue of Ahilyabai Holkar, a former queen of the kingdom of Malwa, in front of the historic Rajwada Palace of the erstwhile Holkar dynasty. Shah also offered prayers at a Mahalaxmi temple located in the vicinity. The BJP chief launched the campaign from a famous 'paan shop' in Rajwada and its owner offered a 'paan' to Shah. Standing on the footboard of his vehicle, Shah greeted the people gathered in the area and then travelled from Rajwada Palace to Krishnapura Chhatri, covering a distance of about half-a-kilometer. Lok Sabha Speaker Sumitra Mahajan, who is the BJP MP from Indore, Chief Minister Shivraj Singh Chouhan and other senior party leaders accompanied Shah. The mass contact programme will cover the Malwa-Nimar region of western Madhya Pradesh, an area considered a BJP bastion. The BJP is in power in Madhya Pradesh since 2003.